Tessa is back! Miss Tessa Lancaster is back with Protection for Hire Book 2! The story continues about one year after the end of the first book by Camy Tang, Protection for Hire. Tessa is continuing to protect her charges while volunteering at the battered women’s shelter. She thinks about handsome lawyer Charles Britton a lot, but she can’t decide if she wants to kiss him or punch him. They are thrown together in order to investigate and protect the father and daughter involved in a rigged singing TV competition. Will Tessa be able to protect everyone she cares about? Is it possible her mafia-boss-uncle is involved with the gambling scheme? Can she learn to forgive Charles for hurting her? Can she and Charles discover who all is behind the mysterious email mistakenly sent to her client before it’s too late? 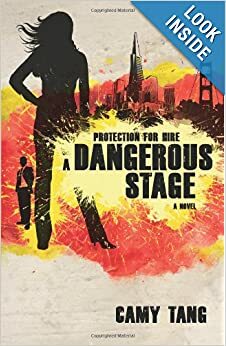 I’ve been looking forward to reading A Dangerous Stage ever since I finished reading the first book, Protection for Hire. I have read all of Camy Tang’s books. Her characters are so real and relevant. I loved getting sucked into Tessa’s fast-paced world filled with paranoia and Japanese yakuza. Tang writes with an authenticity that is contagious and leaves you wanting more. She is especially good at weaving in updated references to movie or television characters, which made me smile. Tessa’s character must learn to forgive in order to move on in her life as a Christian. The reader can relate with the way that Tessa struggles with anger and bitterness. She feels betrayed and doesn’t want to forgive but in the end, she realizes what is more important. It was interesting reading about how her relationship with her father was influencing her relationship with Charles. I highly recommend this book and series for anyone who enjoys a good mystery suspense with some Christian values and romance thrown in. You won’t regret this read – I read it in less than a day! Now, I can’t wait for the next book to come out! I received this book free from the author (as a contest giveaway) but was not required to write a positive review. Thanks so much for the review, Kim! I’m so glad you enjoyed A Dangerous Stage!